(2017-01-16, 16:45)tredman Wrote: Transcoding vs transcoded - if i understand it correctly once files are transcoded (or optimised in plex speak) for plex sync they are stored on the adopted storage once the transcoding is complete. Yes, no need to test I just did. So that must have changed since the last time I used it, but you're correct that transcoding can use the adopted storage. In the first post indicates that the original shield as a USB type-c port, is this correct? I love the new game controller (lightweight, very responsive), but don't care for the new remote (cheap feel to it, needs direct line of sight). I initially had the Shield mounted behind the TV, and the remote didn't work well. Moved Shield under the TV on a shelf and works fine. Wondering if remote is IR; thought only the Pro version is supposed to have IR? 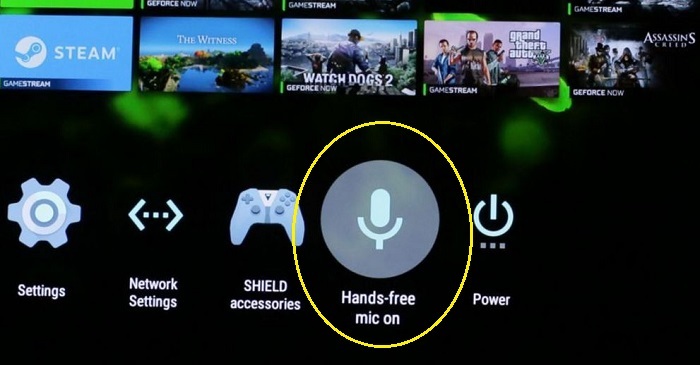 Also, how do you enable the always on mic on the controller? Works fine if I press the nVidia button, but not seeing the icon in the launcher as shown in CES demos (see pic below). I have the latest f/w. BTW, if anyone's interested, you can get the Shield for $174.99 w/$25 off at Best Buy using VISA Checkout... see this. Yes, the 2015 16GB Shield has 2 USB type A, and one USB type C, micro-USB. This is still standard on the Pro models. (2017-01-16, 19:14)hdmkv Wrote: I love the new game controller (lightweight, very responsive), but don't care for the new remote (cheap feel to it, needs direct line of sight). I initially had the Shield mounted behind the TV, and the remote didn't work well. Moved Shield under the TV on a shelf and works fine. Wondering if remote is IR; thought only the Pro version is supposed to have IR? No, the new remote is BT, but has a IR blaster for your TV. It's in the Specs sheet by the way. You may have interference causing issues. The 16GB model does not have an IR receiver. I'm not sure about the controller, but what's stated above in the 2nd post about the controller is taken from the response that I got from Nvidia. EDIT: From my understanding (still waiting for the update on my old Shields) Google Assistant is not yet available on the Shield, if so, it may come with that addition. Hmm, okay, thought Google Assistant would be available out of the gate w/new Shield units. I have Amazon, the side settings options and other elements that are part of the new software as demo'd at CES. Re: the new remote, I don't know why it seems to need a line of sight. Even with the Shield about 10-15ft away from me, if I point the remote toward the floor (instead of directly at the Shield), commands don't register. I also see it sometimes shows as 'disconnected' when it's not. The game controller on the other hand is rock solid. Hoping a further f/w update (I'm on latest v1.1 right now) for remote will improve it remaining connected better, as well as its responsiveness. I'm just going from reports that I've heard that Google Assistant isn't included yet. As I said I haven't received the update yet so I'm having to go by what I've been told directly or what others have said. But nearly all the other features are part of the Android update, GA is something separate. I should know more by Friday. As for the remote, did you update the FW for it. There should have been an update for the controller and remote that showed up in the Recommendations row. (Again, according to what others have said). Surely no point in buying the 2017 if you already have the 2015. Not sure you can get the 2015 + remote @ $200 currently, though, but if you can, it's probably a better buy, indeed. I have a question about GeForce on NVidia grid (not sure what you call it). TechCrunch put up a glowing review of the new box yesterday in which they said it can stream those Grid games at 4k. (Impressive). (2017-01-16, 21:07)PantsOnFire Wrote: I have a question about GeForce on NVidia grid (not sure what you call it). Which has nothing to do with Kodi. If you have a question about GeForce streaming post on the Nviida forums, link is above. Sorry! I will do that. Although I do not mind the feel of it. I am having an issue with the remote as well. I have the shield and my receiver in the closet near my theater room. With the firetv remote I have no issue using its remote without being line of site. Unfortunately the shield remote does have a slight issue. I have to press a button a couple of times for it to respond. Almost like it disconnects and then reconnects before you can use it. It is annoying and it might be a deal breaker for me in this specific room. Wow, I really had NO interest in purchasing one of the Shields, but really hard to turn down a "bargain". That $175 with free shipping is really tempting. However, I almost pulled the trigger this morning on this "$52 off for VOYO VMac V1 Mini PC $128GB only $217.99". I went to the Geekbuying site, but nowhere can I find a code go get the discount, otherwise I would have ordered it. Now my quandary, which device do I purchase with my limited funds. To be noted, I have numerous Android TV boxes, including the Mi box and my newest one the Zidoo X9S (which I only use for occasional testing). I also have a Beelink MiniMX 3, running libreELEC, that I use occasionally for watching my BlueRay rips. The box that I am concentrating on now, is my $40 Amlogic S905x running Ubuntu 16.04. So, I really don't NEED either the new Shield or the fairly new Voyo VMac V1, (will have to figure out where to locate it in my entertainment center) or which one of my boxes I will have to return to storage. I am just itching for a new toy to play with. Any convincing arguments on which of the two I should get? ?